Jaffna, described as the cultural capital of the Sri Lankan Tamils has for decades been a war affected region. The absence of military conflict in recent times has afforded an opportunity for the ravaged people to re-build their battered lives. Many hands of concern and amity have been extended in friendship towards the North as its denizens strive to restore tranquility and harmony into their shattered society. Genuine people-to-people contact of a heartfelt nature at multiple levels is providing the healing touch which a society wounded by war requires so badly. Chundikuli in the heart of Jaffna town experienced such a healing touch on Friday August 31st when a group of students and teachers gathered in the evening for magical moments of healing through music. The school hall of Jaffna’s Chundikuli Girls' College was alive with the sound of music as one of Sri Lanka’s foremost musical exponents shared her time, energy, expertise and above all emotions with a group of students and teachers. 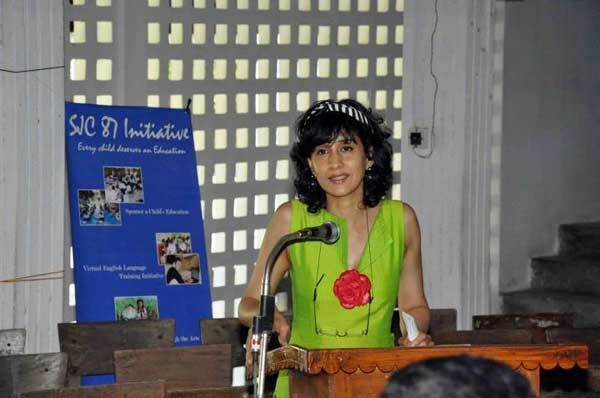 Internationally celebrated Dr. Tanya Nissani Ilangakkone Ekanayaka known generally as Tanya Ekanayaka was in Jaffna on Aug 31st to conduct a musical performance and workshop titled “‘A Moment Of Healing For Us All Through Music”. The workshop was jointly organized by two leading girls' schools in Jaffna namely the Chundikuli Girls’ College (CGC) and Uduvil Girls’ College (UGC) in collaboration with the SJC87 Initiative based in Australia. SJC87 is a non –political organization registered in Australia whose membership consists mainly of the 1987 batch of students from St. John’s College (SJC) in Jaffna. The SJC87 initiative concerns itself chiefly in funding and organizing projects in the educational sphere focusing on children affected by the war in Sri Lanka. The SJC87 initiative has since October 2009 awarded 220 Scholarships to needy students to continue with their studies. The Initiative has also helped war affected schools to set up and stock school libraries, construct or renovate school playgrounds, provide students with books, stationery school equipment etc. It also funds food aid for students in some instances. Among the projects organized by SJC87 were creative art and artistic communication programmes in the north during the years 2009,2010 and 2011.They were first conducted by St. John’s College and its sister school Chundikuli Girls’ College. They were later extended to some other schools too. Conducting a musical workshop to provide the healing touch to war-affected children was however a first of its kind for the Initiative. The power, emotional impact and utilitarian value of music has been felt and realized by people from all walks of life throughout the ages. It is a sublime form of expression. “Music”, in the words of French writer Victor Hugo “expresses that which cannot be put into words and cannot remain silent”. Music also reaches out transcending barriers and as the American Poet Henry Wadsworth Longfellow stated so aptly “Music is the universal language of mankind”. Apart from being valued as a mode of communication, music is also being appreciated for its therapeutic effect. It is being recognized as a curative and restorative instrument. It is a medium of healing on individual, group, personal and social levels. It was in this context that the music workshop was conducted by Dr.Tanya Ekanayaka in Jaffna. The genesis of the project is rather interesting. Dr.Tanya Ekanayaka revealed to newspapers that she would like to conduct piano performance workshops for music students in small groups. Nathan Sooriyakumar, a livewire of the SJC87 initiative living in Australia who came across one such article got in touch with Dr.Ekanayaka. When invited by Sooriyakumar to conduct a workshop for Northern students, Tanya Ekanayaka readily agreed to do so. She suggested that it be a workshop of a healing nature using music as a therapeutic tool. Thereafter arrangements were made rapidly for the workshop. Obtaining the services of Dr. Tanya Ekanayaka on a voluntary basis to conduct the workshop in Jaffna was a virtual bonanza for the organizers. She is well-known in the realm of music both in the Island as well as beyond its shores. For the benefit of readers who may not be aware of the multi-faceted talents, achievements and qualifications of this illustrious personality, I am reproducing here excerpts from the biographical sketch posted on her website. “Tanya Ekanayaka (Tanya Nissani Ilangakkone Ekanayaka) is among Sri Lanka’s most distinguished classically trained pianists. She is also a composer, improviser and musicologist in addition to being a highly qualified linguist. She began studying the piano when she was just five years old, made her debut public recital appearance at the age of twelve and has since performed widely as soloist, accompanist and in ensembles both internationally and in Sri Lanka. Consistent with her interdisciplinary background, Tanya holds a Bachelor of Arts (BA) Honours degree in English Literature and Linguistics from the University of Peradeniya, a Master of Science (MSc) degree in Linguistics and English Language from the University of Edinburgh in Scotland, and a Doctorate for her interdisciplinary research involving the disciplines of Linguistics and Musicology also from Edinburgh University. She is also a Fellow of the Trinity College of Music London (FTCL), and a Licentiate of both the Associated Board of The Royal Schools of Music (LRSM), and the Guildhall School of Music and Drama (LGSMD) UK. The Guildhall school awarded her its Professional Performer’s Diploma (PPD) in 1999. Tanya is currently on the staff of Edinburgh University in Scotland where she has been teaching part-time in both its Departments of Linguistics and Music since 2007. What characterizes Tanya as a recitalist is her quintessential recital style. Her recitals have increasingly included her own compositions representing a novel form of musical fusion as well as works from the established classical repertoire ranging from baroque to contemporary works. Her compositions within a recital programme tend to self-consciously adapt indigenous and popular Sri Lankan folk melodies which are then reinterpreted, transformed and integrated within musical frameworks inspired by the western classical works of the same programme. In this sense, Tanya’s recitals become a discourse where the merging of genres and eras is facilitated - classical with popular and folk song, the historical with the contemporary. As such, her work may be seen as transgressing and in so doing conflating the borders of temporality. Tanya regards her compositions as deeply autobiographical ‘moments’. She attributes her compositional style to her multilingual and multicultural backgrounds as well as to being ambidextrous and having partial colour synesthesia. She is a native speaker of English and Sinhala and grew up in the city of Kandy in Sri Lanka where she was exposed to a broad spectrum of music from a very early age. Devoting endless hours to evolving semi-improvisational compositions was how she attempted to comprehend and express the kaleidoscopic convergence of these various cultural and linguistic facets which seemed to define her. Tanya’s recent compositions have also been influenced by her interdisciplinary doctoral research which addressed questions relating to whether there are differences between communities’ collective perception of language in particular language mixing in music (i.e. songs) and their perception of language and/or language mixing in non-musical environments. Having discovered interesting differences between them her research included the formulation of a theoretical model designed to explain the differences. In Sri Lanka, Tanya studied the piano under the tutelage of her mother Indira Ekanayaka and later with Bridget Halpé. At sixteen Tanya was the youngest competitor and joint winner of the biennial Symphony Orchestra of Sri Lanka (SOSL) Concerto Competition (Pianoforte). In 2006 Tanya was awarded the ‘University of Edinburgh Principal’s Sri Lankan Scholarship’ for postgraduate studies in linguistics. In July 2010, Tanya became the first Sri Lankan pianist to perform in the ‘Pianists of the World’ series at London’s St Martin-in-the-Fields, one of the oldest recital series of St Martin-in-the-Fields having been founded by the legendary Dame Myra Hess. The audience at this concert was reportedly among the largest audiences recorded at lunchtime concerts at St Martin-in-the-Fields. Tanya’s programme concluded with the world première of her composition ‘Adahas: of Wings of Roots’ which was the first Sri Lankan composition to be performed at this venue. This composition is an example of the distinguishing feature of Tanya’s recitals. In 2011 Tanya was invited to serve on the international panel of adjudicators at one of the world’s biggest music festivals, the ‘Hong Kong Schools Music and Speech Festival’. She adjudicated the piano division of this festival. Among other recitals, 2012 has seen Tanya debut in the USA on 31st May with a solo recital at The John F. Kennedy Center for the Performing Arts in Washington DC (USA) following an invitation by The John F. Kennedy Center for the Performing Arts and a performance at the Asia Society Concert Hall in New York in June. Performing to a full house (the audience reportedly among the largest observed at this particular concert stage) Tanya’s programme for her recital at The John F. Kennedy Center for the Performing Arts incorporated the world première of two of her own compositions which are the first compositions for the piano by a Sri Lankan to be performed at this venue. Tanya has since been invited back to give another solo recital at London’s St. Martin-in-the-Fields and looks forward to doing so in November this year following recitals in Colombo”. Tanya as she prefers being called flew into Palmyrah land on Friday afternoon. The workshop began at 4 pm and went on for 150 minutes ending at 6.30 pm. Initially a larger group consisting of students and teachers from seventeen schools in the Peninsula and the Northern mainland known as Wanni was expected. Transport problems on account of Friday being a Poya day holiday as well as other logistical difficulties made the organizers restrict the number of participants later to sixty. Over fifty persons assembled at the CGC hall for the workshop. Among the participants were forty students from six schools namely Vembadi Girls’ College,Jaffna, Chundikuli Girls’ College,Uduvil Girls’ College, St.John’s College Jaffna, St.Patrick’s College ,Jaffna and St. Anthony’s College,Kayts.The students of mixed gender were mostly in the 10 – 17 age group. There were also nine teachers, two school principals and a few involved parents in the gathering. 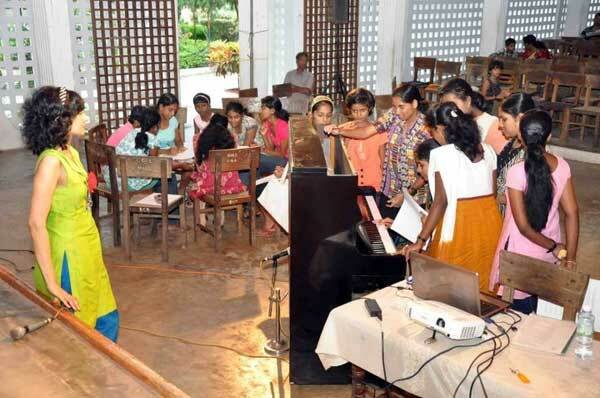 Two of the teachers taught music at Tharmapuram Maha Vidyalayam and Uruthirapuram Maha Vidyalayam in the Kilinochchi region. Organizational aspects of the workshop were undertaken by teachers from CGC and UGC and coordinated by Ms.Renuja on behalf of the SJC87 initiative. At the inception a clip from Tanya’s path-breaking recital at St. Martin’s in London was played over TV. This was her own composition “Adahas” meaning thoughts in Sinhala.The piece titled " Adahas:of wings of roots” was created specifically for the London recital in about fifteen minutes.It integrates some elements of Bach,Beethoven and Ravel in synergy with certain sounds of traditional Sri Lankan music. While Adahas relates to thoughts the term “wings” is a metaphor for re-invention and “roots” represents the sources of the compositions. The Chundikuli audience was enthralled by the performance. Thereafter the workshop commenced. It was structured into two segments. The first segment saw an introductory talk by Tanya. Initially she was worried about how well a talk delivered directly in English and interpreted into Tamil would resonate with her young participants. To her immense relief and satisfaction Tanya found that this was no barrier at all and as the workshop progressed language ceased to be a factor hindering communication. Tanya also realized that some students were somewhat intimidated by the presence of their teachers and tongue-tied. She set about allaying such inhibitions by approaching them individually and urging them to express themselves through music. It was emphasized that the workshop was not restricted to the piano or western classical music. Any mode of musical expression or any musical instrument was acceptable. Even thumping of chairs and drumming on tables was encouraged.Also musical traditions ranging from Carnatic music to Christian hymns were recognized and deemed acceptable. This direct approach by Tanya at a close, personal level helped break the ice and made students relaxed. They were also infused with a tremendous sense of enthusiasm that induced whole-hearted participation. The second segment was even more popular and successful. The students were divided into four groups of ten each. The children were asked to name the groups to which they belonged and elect leaders. The choice of names was both amusing and revealing. One was called “Gangsters”.Another was “Rockstars”. The third was named “piano guys”. The fourth one was “Fillies”. Each group was asked to select five words indicative of their past or shared experiences. Then they had to make a sentence incorporating all five words. Thereafter they had to express the essence of the meaning conveyed in the sentences through some form of music. The students had to convey the meaning of words through their own music composition. Musical creativity as a substitute for language was urged. The results were amazing. Tanya was very much impressed by the versatile creativity of the young students. Music was successfully utilized as an alternative language to facilitate mutual healing. They shared their narratives among each other through the language of music. Tanya thought the collaboratively composed musical compositions were “beautiful and creative” the students in her opinion were “extremely gifted and spirited”. As the event was about to end there was a popular request that Tanya play for the audience. She obliged by playing a solo piano composition by the Russian maestro Tchaikovsky. Pyotr Ilyich Tchaikovsky had composed a set of twelve short character pieces to denote the twelve months of the year called “Les Saisons”(the seasons). Although the month was August , Tanya chose to play the immensely popular “Barcarolle” in G minor composed for June or Juin. The children crowded around Tanya after the workshop was concluded. Most of them kept asking whether she would come again to Jaffna. A few got her e-mail address promising to contact her. A thoroughly moved Tanya pledged that she would come again. Chundikuli Girls’ College principal Ms. Dushy thuseetharan presented Tanya a memento as both a token of appreciation as well as a souvenir. Although her paternal grandfather had worked for many years in Jaffna this was the first visit to the peninsula for Tanya. She was taken on a tour of Jaffna city by car after nightfall. She stayed overnight at the Chundikuli Girls’ College hostel instead of a luxurious hotel. In the morning prior to her flight back to Colombo Tanya went sight seeing to theJaffna fort premises. I spoke to Tanya ekanayake on the telephone after she returned to colombo. When asked for her fleeting impressions of Jaffna after her brief sojourn Tanya replied that she was surprised to see Jaffna city bustling and busy even in the night. The roads were crowded. “Lots of development seems underway but there is much more to be done in many respects” she said. Having grown up in Kandy ,anya was quite aware of the disadvantages faced by students in provincial towns as opposed to those in privileged Colombo. She is also sensitive to the fact that western classical music and piano playing is perceived as elitist and restricted to upper echelons of society in Sri Lanka. It is this sensibility that makes her receptive to the needs of students in Jaffna. She realizes that the situation there has further worsened due to the long war. It was this consciousness that prompted her to readily grasp the opportunity to go to Jaffna. Tanya also spoke at length to me about language , music, conceptualization, trust, deceit and breakdown in communication etc. Her introductory talk at the workshop had also focused on related themes. As someone who straddles both the worlds of music and linguistics her views provided fantastic food for thought. I was also able to discern that she was passionate and intensely sincere in her views. “Communication is core to human existence - all of us possess a fundamental need to communicate with one another and the principal medium through which we do so is through what might be termed the phenomenon of human Language (note capital L). It could even be argued that our need to communicate with one another stems from the fact that ALL human beings are born with an innate capacity for human Language and begin to acquire it (either one or more languages, whichever they are exposed to) naturally from birth. It is after all this phenomenon of human Language that distinguishes the human species from other life forms and underlies our ability to conceptualise. And so we write, speak, and listen and in so doing friendships, communities and in turn nations are established. ‘Art’ is another medium through which we communicate with one another and music is one such art form. ‘Effective’ communication forms the basis of human existence as we know it and similarly one could venture to also propose that it is the breakdown of ‘effective’ communication between individuals, communities and nations that underlies the pain and tragedy that prevails between many of them all over the world. What leads to the breakdown of effective communication between individuals, one might ask. I found Tanya Ekanayaka refreshingly candid and clear in whatever she said.It was indeed a pleasure to converse with her.She was very happy about her Jaffna trip and workshop.”I am certainly committed to going back to Jaffna at some point when I visit Sri Lanka next in order to continue the work I’ve started.” She informed me. Plans are being formulated by the SJC87initiative to conduct a second healing through music workshop in November this year when Tanya will be back in Lanka for a few weeks. This is likely to be held at the Uduvil Girls College with a larger number of participants. There is also a move to invite Tanya’s parents for it.One hopes that things work out positively and Tanya would be able to conduct the Uduvil workshop as envisaged.